A lot of people like to leave their fridge door an empty vast expanse of white or brushed aluminum. Others prefer to cover every inch with photos, calendars or any magnetic based accessories they can find room for. FridgiGears will probably appeal to the latter group of people, especially those with children around the house. 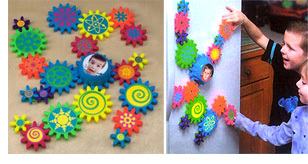 The kit comes with 20 plastic gears of varying size and color that each have a magnet on the back, and are capable of freely spinning when stuck to the fridge. The largest gear is motorized (using 2 AA batteries) and in turn powers all the other gears when laid out and connected on the fridge door. The motorized gear can also serve as a spinning picture frame and the kit includes a series of stickers with ‘wild graphics’ that can be adhered to the gears to enhance the spinning effects. The FridgiGears kit is available from SeeFred.com for $23.